While I was more of a Skyleidoscope kid myself (two words: dragon boats), Surprise in the Skies was one of those rare afternoon shows that garnered my attention. Due to layout constraints, EPCOT Center (or Epcot) has never been full-fledged parade central, which makes large scale entertainment productions a bit trickier. The answer was, and always has been, the utilization of World Showcase Lagoon. 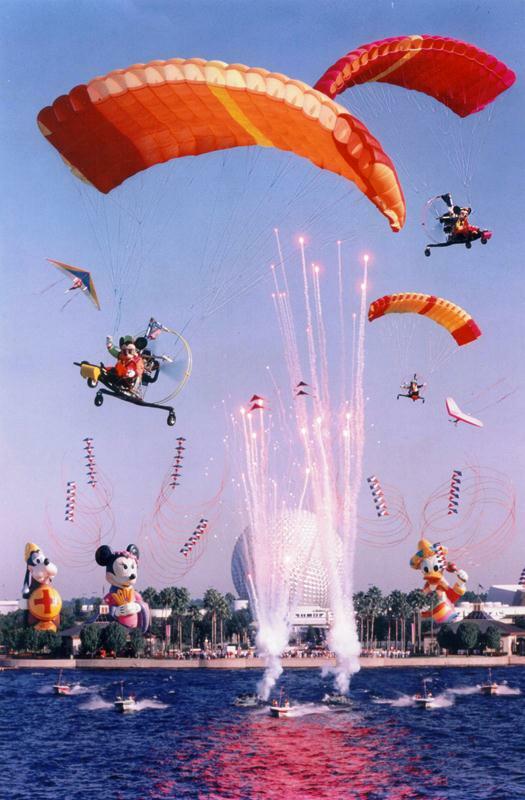 Daytime aerobatics, fast watercraft, colored smoke, and fireworks were the cornerstones of great daytime performances in EPCOT Center. Shows like Surprise in the Skies were crucial to drawing children into World Showcase, children who otherwise didn’t have a desire to be anywhere near the mile long promenade. Wouldn’t it be great to see the skies over Epcot filled with fireworks and flying crafts again? 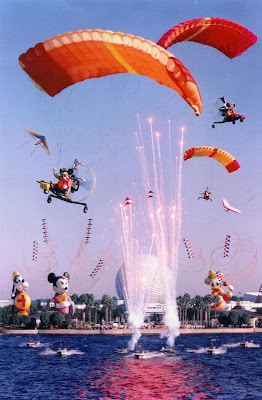 FANTASTIC FINALE – Daytime fireworks, paraplanes, hang gliders, kites and giant balloons combine for “Surprise in the Skies”, the new daytime show at Walt Disney World Epcot Center. Mickey Mouse and other Disney characters pilot paraplanes over World Showcase Lagoon, while speed boats pull red-white-and-blue kites into the sky and 45-foot tall cold air balloons highlight each of the pavilions. I liked this show; something to break up the afternoon. I do wish though that they'd bring back the Tapestry of Nations Parade. Loved that! Speed boats can now be use for entertainment which kids and even adult would attract and love it. Before speed boats usually use by adults but now even teenagers love to do their past time riding on a boat.